Which South Park character's evil double from the Evil Parallel universe in "Spooky Fish" would anda like to meet (Part 2)? Which South Park dad is most like your dad? 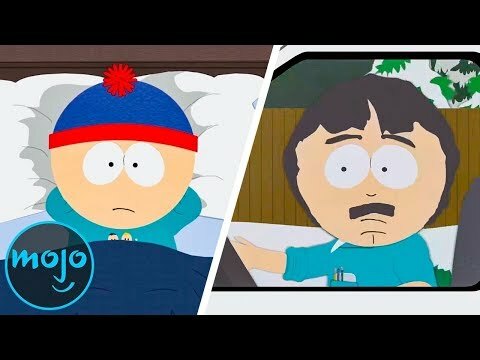 Has there ever been a South Park episode anda DIDN'T like? How do anda gabung this club? Name your favorit South Park pairings! Kenny has lebih to his character than just dying all the time, he's developed a personality now. He deserves to be in the puncak, atas 10 because he is very caring to his sister, Karen, oleh using Mysterion to protect her from bullies, and got a job just so he could buy her a doll. I used to not care for him at all, but now he's one of my favorites. Mr Garrison: I berkata take your goddamn seats!! Mr Garrison: Alright. So as I was saying, we have a new student that will be joining in our class. Butters: Is it a boy? "Deep in the lands of Zaron, the humans of Kupa Keep struggle to stay alive as they are attacked oleh the wicked Drow Elves of Larnion. Darkness falls… as the humans beg their King to save them; a noble King, known only as the Grand Wizard. For a thousand years the battle has been waged, with only the bravery of the Grand Wizard to protect his human followers. South Park is an American adult animated sitcom created oleh Trey Parker and Matt Stone for the Comedy Central televisi network. Intended for mature audiences, the tampil has become famous for its crude language and dark, surreal humor that satirizes a wide range of topics. The ongoing narrative revolves around four boys—Stan Marsh, Kyle Broflovski, Eric Cartman, and Kenny McCormick—and their bizarre adventures in and around the titular Colorado town. Omg i cinta south park i cry my eyes out with laughther it is so hilarious who ever made this tampil should get a thumbs up he atau she is awesome i like there new episodes. anda should watch it. its really funny some people dont like it and say its to inapropiate but they need to let loose and get ahold of themselves.because this tampil should be rewarded most funniest show. thumbs up if u cinta this show. and im new on fanpop my friend berkata its cool and lot of nice people - i dont believe her- i recomend u to watch this ok sorry for my typeing its kinda wrong i type way to fasts. So the tampil is gonna go on? Following the episode “You’re Getting Old”, the last episode in Season 15 before the mid-season break, rumors started to circulate that SP was about to be cancelled.. But don't worry-Season 16 is a GO! It is also berkata that season 17 will air in 2013. If anda like Clyde x Bebe, please gabung the club I made for them. a comment was made to the poll: Should South Park get cancelled? a poll telah ditambahkan: Should South Park get cancelled? Stan's dog, Sparky, is half-wolf and half what else? I know who mysterion is. I know who Mysterion really is!